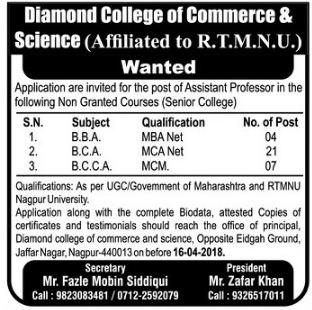 Diamond College of Commerce and Science, Nagpur has advertised in LOKMAT for the recruitment of Assistant Professor jobs vacancies. Interested and eligible job aspirants are requested to apply with in 16th April 2018. Check out further more details below. About College: Diamond Charitable and Educational Trust,Nagpur (India) is a Public Trust, registered underBombay Public Trust Act 1950 bearing Registration N o . E - 1 8 4 2 ( N a g p u r ) . All the Trustees of this trust are well qualified and professional in educational field. The main objective of this trust is to provide latest and professional Education and to prepare the students to capture the National and International markets. Diamond College (Commerce, Computer Science & Management Studies) is established to provide the students the best Commerce,Computer Science and Business Management Studies courses combining International methodologies with a blend of localized essence. Our College is affiliated to R.T.M. Nagpur University. With a welcome project of Multi Modal International Hub Airport at Nagpur (MIHAN) which is opening new vistas for businessman and entrepreneurs at 4311 Hectares of futuristic business plan, more than 100,000 direct employment with 3,00,000 employments in ancillary units are waiting for the youth of Vidarbha. How to Apply: Interested and Eligible candidates may send your detailed resume along with recent passport size photograph and necessary documents to following Postal address with in 16th April 2018.